The online home of CyberaTech – Home of Alison Cybe, freelance author and gamer. Come on in, enjoy my reviews of board and RPG games and check out some of my short stories – all for you! 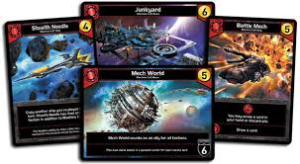 Star Realms offers a hearty and high-speed deckbuilding competitive science-fiction battle right out of the box, chocked full of spaceships and battle cruisers ready to assail your enemies! 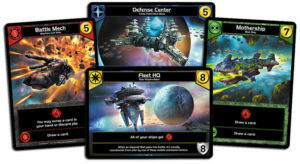 Concepts: Star Realms is a competitive deck-building battle game for two players, with optional additional rules for more players. It is not a collectable or living card game, and is fully playable to an advanced level using the cards in the box This is because both players share the same deck, and purchase spaceships from it in order to lay down some cosmic pew-pew on each another. So if you want a game that relies more on resource management and skill than which player has bought the most powerful and expensive cards on the secondary market, this is worth looking at. Writing: The game has a brief sci-fi themed backstory involving four factions. These factions include the empire (represented by yellow cards in the game), trade federation (blue), the mysterious bio-alien ‘blobs’ (green) and the machine cult (red). Although there is a small storyline to this game, it is not particularly emphasised and is not an important point to the game – but it wouldn’t hurt to have some. Mechanics: Each player begins with a set of basic cards which form a hand of ten – eight ships which are worth 1 credit when played, and two which are worth 1 attack when played. On each player’s turn, five cards are played from the player’s hand. Obviously for the first few turns, you’ll be dealing in small change and cheeky little jabs – the total value of attack is dealt to the opponent (or their bases) and the total value of credits is used to purchase additional ships from the trade row. The trade row is pretty much the galactic car salesmen, a set of five cards drawn from the main deck – when a ship is purchased, the slot it occupied on the row is replaced with another card. At the end of the player’s turn, the cards they have played that turn, along with any ships that they have purchased that turn, are discarded and a new hand of five is drawn – but don’t panic, they’ll be back! If they are unable to draw five, the discard pile is shuffled to form a new draw pile, and the player draws up to their hand limit again. The players can buy any card from the trade row, regardless of that card’s colour/faction. In fact, the colour of the card is a key strategy to victory. Yellow cards excel at making your opponent discard cards from their hand, limiting what they can do in their next turn. Blue cards are able to heal damage, while green cards are great for huge damage-dealing. Red cards let you scrap (remove from play entirely) cards from your deck, which is valuable in getting rid of those early game cards that you no longer need. Many of those cards have additional triggers that activate when other cards of the same colour are in play, or deal last-ditch effects if you’re willing to scrap them. Lastly, some ships are actually bases – cards which don’t go to your discard pile at the end of the turn, but stay in your play area, dealing their effect over and over until your opponent takes them out. Think of them like your own portable Death Stars which can blast away turn after turn! They do this by dealing more damage than your base’s defence value in one turn. For the most part, the opponent could just ignore them, though, if they are comfortable with them sitting there – however some bases are ‘outposts’, which prevent the opponent from taking damage until they are destroyed. Design: The artwork on the cards is entirely fantastic throughout, both evocative and beautiful. Each faction’s ships has their own distinctive style, and many of the larger battle cruisers and space fortresses look outright stunning. The layout of the cards are very clear and easy to read and understand. 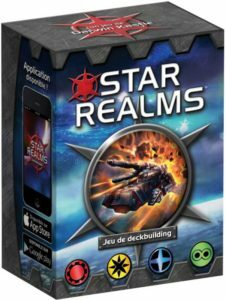 Playability: Star Realms is extremely easy for new players to pick up and play, due in no small part to its clear layout and focus. It lacks the gimmicks of many deck-builder games, focusing instead on raw balance and fast, skilful gameplay. As your playstyle develops, you begin to recognise how important combo triggers and using the right colours for the current phase of the game are, all of which give the game a lovely amount of depth. Star Realms is a game which appears, at first, to include a lot of luck. In actuality it requires a lot of skill. To play the cards that you want, you need to whittle down your deck with careful application of red cards. While the cards that appear on the trade row are random, it’s ultimately what the players choose to do with them that will determine the course of battle. Conclusion: Star Realms is a fantastic game which maintains a fast pace and exciting style. It has all of the fun of a tournament level card game in one little (and affordable) box, although I wish that White Wizard Games pushed for more tournament gameplay. The considerable depth that the gameplay offers is complimented by the easy pick-up-and-play nature. FINAL THOUGHTS: An exciting and fast-paced action card game that offers surprising amounts of depth, challenge and fun. Definitely worth checking out!